The Easiest Way to Get (at Least) $25 Off Your Next Order! Once your friend’s first order is delivered, you will automatically be credited $25 for your next order. So, if you’re happy with our service, our products and our convenient delivery…you can benefit. 1. If you’re at a restaurant with inevitably large portions, then ask for a to go box as soon as your food arrives. Place part of your food in the box immediately, and put it aside. This way, you won’t be as tempted to eat the entire plate in front of you. If you’re really still hungry, you can always dig in to the extra food, but this will cut down on the chances of eating more even when you’re full. We recommend storing your fuel inside in a dry area free from flooding, mold, and excessive humidity. Inside storage is really your best bet for efficient storage. If you have the space, reuse the wooden pallet your fuel arrived on. Place it in a dry area, put cardboard over the pallet, and stack your bags on top. The pallet is built to hold weight, so you can stack your pellets nice and high. We all know hot dogs and hamburgers on the grill are great in the summer. Sometimes, however, it’s nice to let someone else do the cooking. 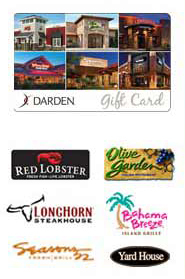 For the whole month of July, if you buy three or more tons, Woodpellets.com will send you a $50 Darden restaurants gift card to have dinner out on us. Leave the kids with a sitter for date night, or bring them with you for a family night out on the town! You need quality wood pellets delivered for the heating season, and in this case, the early bird gets the meal. Secure your fuel in July and let us reward you! Give your grill a rest. Summer is here, the weather is warm and your kids need some entertaining. Have you heard of water blobs? 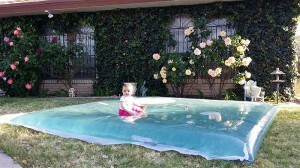 They are an easy and inexpensive way to keep children busy and cool outside. Water blobs are literally big blobs of water. Typically, they are made of two plastic painter’s tarps duct taped or fused together, then filled with hose water and sealed up. (Tutorial here) The blobs are great for laying and jumping on, and even exploring for the smaller kids if you put some colorful foam toys inside. 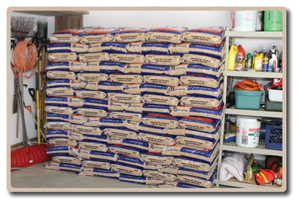 You may have read our blog about what to do with empty wood pellet bags. 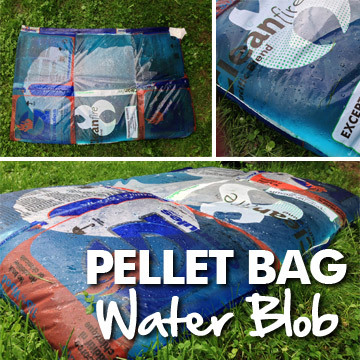 For summer, we thought of a way to use your pellet bags for this popular water blob trend! See below for a step by step tutorial on how to make a water blob out of those empty wood pellet bags you might have laying around from the heating season. At least 8 empty pellet bags. You’ll need more for a larger blob of course.